First you need to create a ASP.NET Empty web application. You can do this using dotnet new web -o HelloSignalR command. Next you need to add the reference of SignalR package. You can do this using dotnet add package command. Here is the command dotnet add package Microsoft.AspNetCore.SignalR -v 1.0.0-alpha1-final. Once you’re add the reference, you need to open the project in your favourite editor, I am using VS Code here. Add new file, name it as Chat.cs, you should inherit Hub class. Here is the implementation. Unlike earlier versions of SignalR, there is no dynamic object, it is InvokeAsync method. You need to pass the client method name and parameter(s). Next you need to configure your application hub to handle the requests. 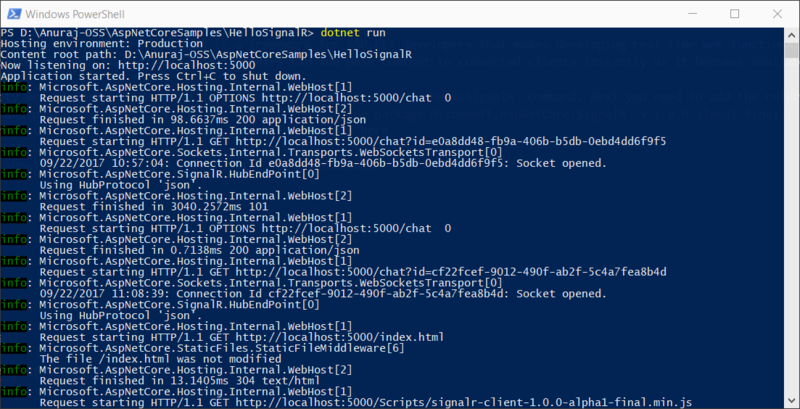 For that you need to inject SignalR to request pipeline and configure chat hub endpoint to handle the requests. You can do this using UseSignalR extension method. First you’re creating the connection object using new signalR.HubConnection('/chat'), you need to give the SignalR endpoint as the parameter. Once you created the connection object, you can use invoke method to invoke the method implemented in Hub. You can use on method to listen for the events invoked from server. If you want to use the Hub in Controller, you can add a parameter in the constructor of type IHubContext<Chat>, ASP.NET Core runtime will inject this type to the controller, which you can be used to interact will client objects. To use SignalR in Windows Forms / WPF / other native apps, you need to reference Microsoft.AspNetCore.SignalR.Client package. Then you can use it like this. I am using SynchronizationContext to avoid the cross thread exceptions.